If it's in the lesson, it's in the box! Easy for volunteers—great for kids! What if you could literally open the box and start your lesson? Buzz makes Sunday school sweet & simple. Preparation is simple—if it's in the lesson, it's in the box! With Buzz, all you prepare is your heart. Read the Bible background. Enjoy a weekly devotion. Pray for your kids. You’re ready! Preparing to teach Buzz is stress–free and meaningful. 3 Photos from left to right: A group of children gather around a table and play a board game with their Sunday school teacher. A group of children pour intently over the Buzz learning materials. A Little girl and her Sunday school teacher smile as they aim rubber band launchers at the camera. You'll find it easier to recruit and retain volunteers because they don't need to spend time gathering supplies or prepping for the lesson. They just open the box and go! The only thing your volunteers need to do each week is to prepare their hearts. With Buzz, each lesson is intentionally designed to allow kids to choose which direction the lesson goes. Kids are fully engaged because they are choosing what they are learning, and how they are learning it. 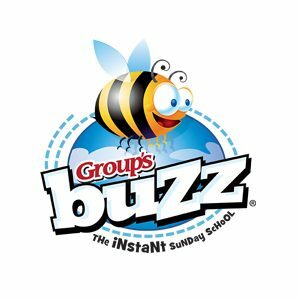 Buzz Sunday school is designed to work best in churches that divide kids into age-graded classrooms with 10 or less kids per class. 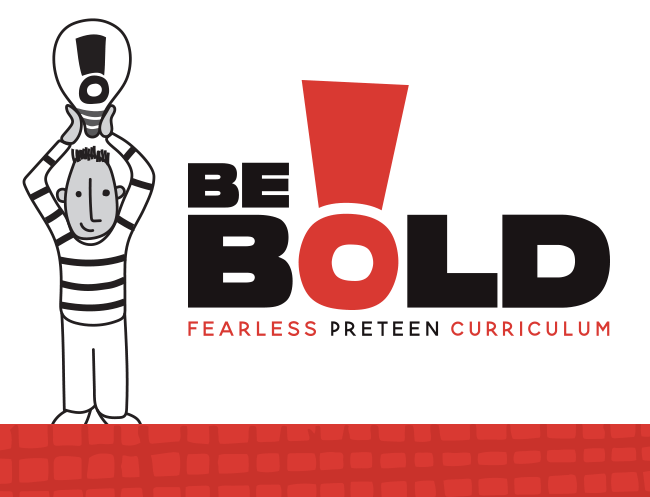 Each grade level (preschool through 6th) has a unique theme every quarter that teaches a mix of classic and uncommon Bible stories that kids haven't heard before–which impacts their faith and changes their lives. 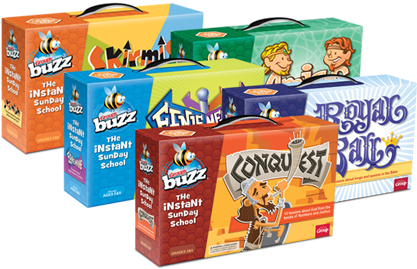 With Buzz, you'll reinvent the Sunday school experience at your church! Using unique game-like activities, lessons are packed with fun, surprise, and kid participation. Kids even get to choose what activity comes next as the lesson unfolds, and they never get bored because they never quite know what’s coming next. The step-by-step flow of a Buzz Sunday School session: #1 Buzz Bond: This relationship-building time helps your leaders and kids get to know one another. (5-10 min) #2 God Sightings: Kids learn how to see God in everyday circumstances throughout their week. (up to 5 min) #3 Bible Buzz: What makes Buzz so special is the unique way Bible activities lead children deeply into God’s Word. Every activity leads to one point for the week. (25-30 min) #4 Buzz in Action: The Point doesn’t stay at church. 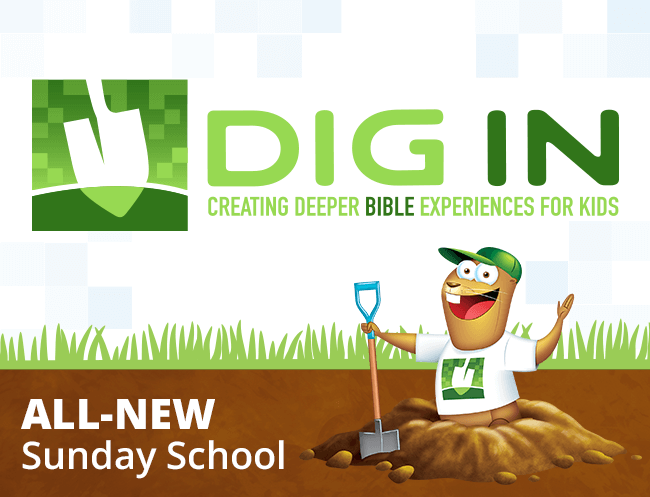 Kid’s learn to live out God’s Word personally by applying what they learn in the coming week. (5-10 min) #5 Let’s Pray: Buzz takes prayer to a new level. Buzz teaches kids how to pray with age-appropriate prayer starters. 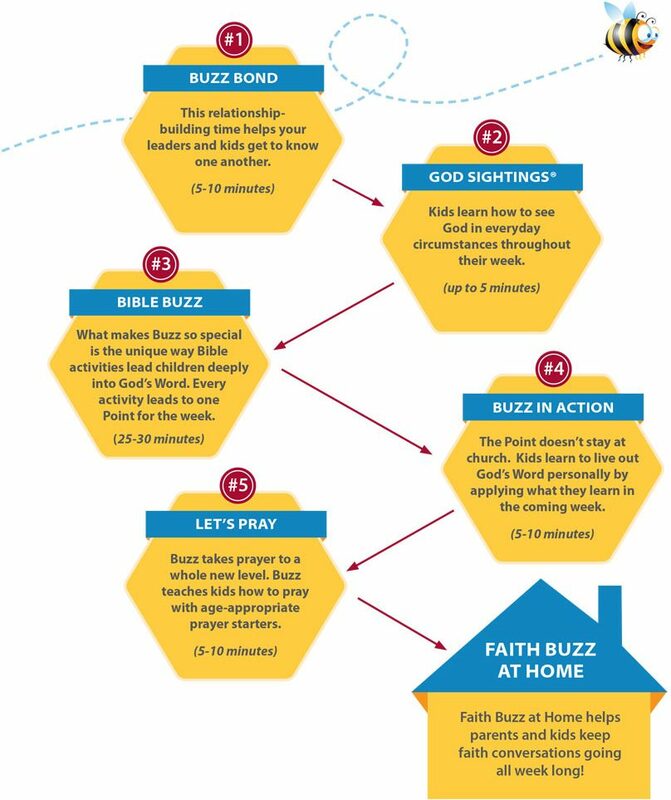 (5-10 min) #6 Faith Buzz at Home: Faith Buzz at Home helps parents and kids keep faith conversations going all week long! Get kids buzzing about God! 2 Photos from left to right: A little girl reads a quiz card while her classmates and Sunday school teacher look on. A group of children sit in a circle on the floor with their Sunday school teacher and make a human knot by linking hands through the center of the circle. Photo: A little girl reads a quiz card while her classmates and Sunday school teacher look on. Buzz Sunday school is totally different from anything you've tried before. Teaching is as easy as playing a game, so even new volunteers or last-minute substitutes can lead an effective Bible lesson. With Buzz, there are no student books or additional purchases for students required. There's no need to run errands looking for supplies or props because everything you need to teach a lesson is in the box! Buzz uses a game-like Quick Start Guide instead of a bulky teacher guide. Teachers and volunteers feel like a success every week because they don't have to worry about lesson prep, and the simple instructions enable them to walk through the lesson easily. The Buzz Leader Devotions helps your volunteers prepare their hearts each week. Instead of looking for supplies, leaders develop their passion for ministry where they can concentrate on the meaning of every lesson and pray for their students. Buzz uses Smart Learning for each and every lesson. Kids remember the Bible lesson because Smart helps them to learn and understand the Bible in the ways that they learn best. Buzz incorporates lesser-known passages from the Bible using fun and memorable themes. You'll expose kids to more of God's Word in ways they won't forget. Faith Buzz at Home brings the fun and learning from Sunday school home. Parents help build faith at home because they are equipped to reinforce what kids learn every week, long after the Sunday school lesson has ended. Kids love to sing along with the great music you’ll find in Buzz Sunday School. grow in their relationship with Jesus! Your Buzz classroom kit includes everything+ you need to lead a fun and engaging lesson. Simply buy one kit for each of your age-graded classrooms. Each kit includes all the activities, gizmos, music and lesson components you'll need for 13 lessons. Two leader devotions are also included. Additional leader devotions and music CDs are also available for purchase. +Only basic classroom supplies (paper, crayons, scissors, etc.) needed. Lesson experiences are intentionally designed to appeal to multiple learning styles to encourage participation and relationship-building. 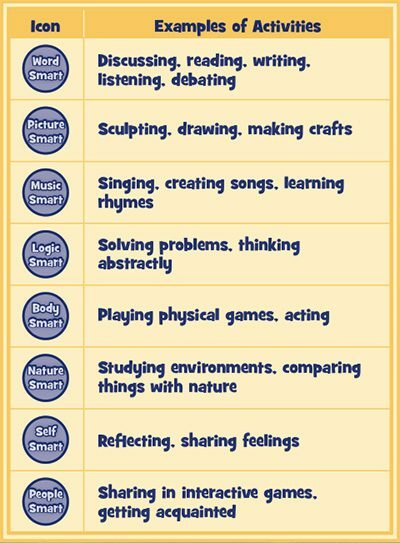 We adapted the multiple intelligences theory, developed by Howard Gardner into this Smart Chart (indicated by "Smart" icons on the Bible Buzz Cards).